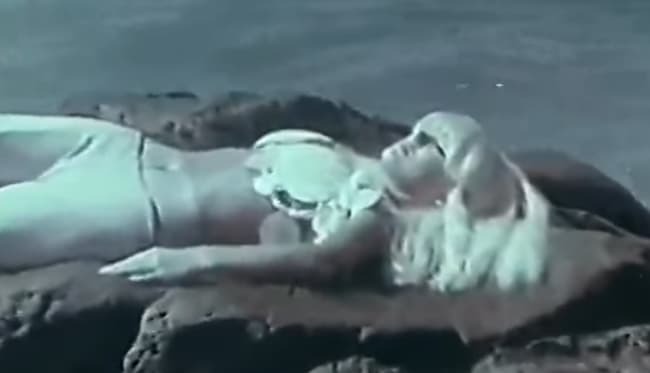 Voyage to the Planet of Prehistoric Women is a 1968 American science fiction film, one of two which were adapted from the 1962 Soviet SF film Planeta Bur (Planet of Storms) for Roger Corman. The original film was scripted by Alexander Kazantsev from his novel and directed by Pavel Klushantsev; the adaptation was made by Peter Bogdanovich, who chose not to have his name credited on the film prints, and included American-made principal scenes starring Mamie Van Doren. The film apparently had at least a limited American release through American-International Pictures Inc., but is best known from subsequent cable-TV showings and home-video sales. Astronauts landing on Venus kill a creature that resembles a pterosaur and is worshiped by the local women. The women try to kill the astronauts by means of their superhuman powers, but fail. Eventually, the astronauts escape from the planet, and their robot, damaged by a volcanic fire, becomes the women’s new god.